Sing along! I’m so excited, and I just can’t hide it! Not necessarily about lunch but the fact that lunch is just up the street from our first motorcycle shopping trip since I skidded my last ride off the road in the mountains. The trip takes us to Peninsula, just north of Cuyahoga Falls, which has a conjoined restaurant I have heard a great deal of advertising about but not necessarily favorable reports. After strolling through way too many chrome covered options we drove up the road a piece to Russo’s but didn’t go to Russo’s. Instead we drove round back to try the more laid back Bacchus Lounge. 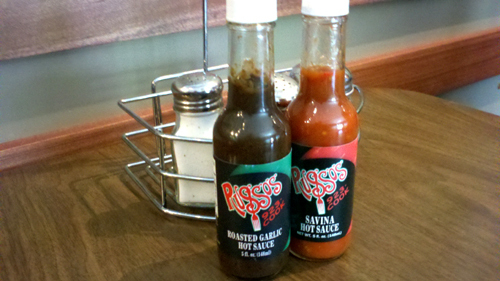 Russo’s and Bacchus share a kitchen which offers New Orleans style cuisine to Northeastern Ohio. We strolled in about an hour before they closed for the break between lunch and dinner. It was pretty quiet with just one other occupied table. Outside of the wobbly table the place appears pretty well put together and clean. The walls are adorned with pictures of musicians from NOLA which are dominated by one of our personal fav’s, Trombone Shorty. The room doesn’t have anywhere near the energy of a T-Bone show but we are at lunch, maybe it picks up at night. We were attended to by a diminutive and muted server who disproved the maxim that less gets done in a restaurant the less busy it is. She stayed on top of both tables while getting all of her side work done. The rest of the room might not make you think a bunch of New Orleans, but what about the food? The online menu and the one of the table were vastly different which left us scrambling for some different options. We ordered a bowl of the gumbo ya ya, a smoked pulled pork sandwich, a shrimp poboy, onion rings and fries. Actual New Orleanders we frequently eat with sought out a taste of home some time ago and found most of the dishes from Russo's too spicy to ingest. 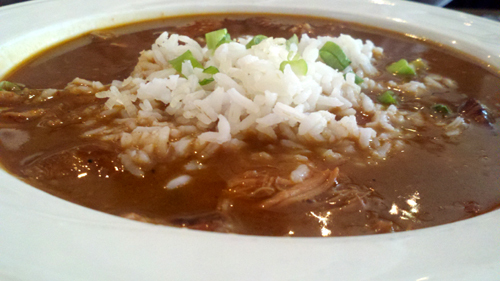 I was worried about the gumbo from Bacchus, it comes from the same kitchen. The bowl we had consisted of a dark and lightly spiced stew which was loaded with sausage and fowl and dressed with white rice. We actually both really enjoyed it. 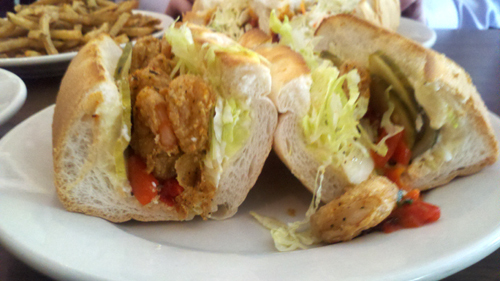 The poboy is strikingly similar to the offering at Cajun Dave’s in Kent, Oh and really doesn’t beat out the version from the Blue Door in Cuyahoga Falls. But the one at the Blue Door was downright tasty. I haven’t been to Domilice's, Mahony’s, or Mother’s (YET!!!) in the actual Big Easy but I imagine the local grinders are getting some things right. The outstanding ingredient for the three locals I have tried is the bread. Like Pizza crust in New York there is something reportedly special about the poboy bread on the bayou and if it is better than these three rolls I can’t wait to get there. The shrimp were tender and cased in a corny crunch. Fully dressed it was an appetizing lunch. 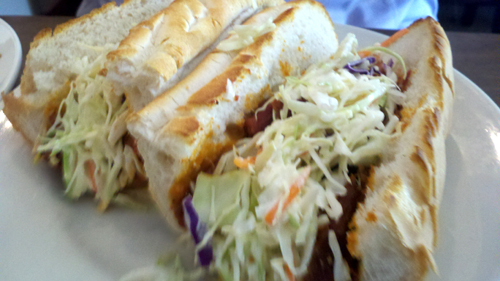 I splashed a bit of each of their hot sauces on the poboy. The roasted garlic was unmistakably loaded with the stuff while the savina hot sauce had a nice punch from the pepper but was dominated by a serious vinegary thump. Not bad at all. Malt Vinegar Powder On Fries? Super Genius! Like Wiley E. Coyote. The pulled pork was less successful. Same bread, but the smoke on the meat had a pointed punch to it that threw the tender pork under the proverbial bus. The slaw on top is referred to as “Creole” but I couldn’t imagine what makes this cabbage and mayo mix Creole. The ancho BBQ sauce was actually really nice but was beat into submission by the sharp smokiness. 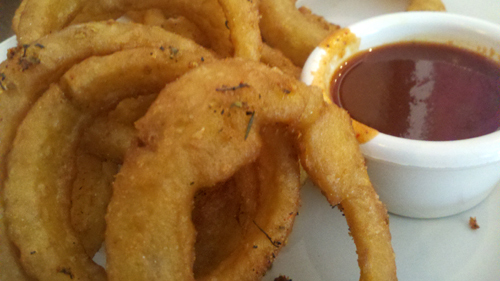 The BBQ sauce also comes alongside the onion rings which were very nicely done with an interesting spice profile built into the batter which clings to the veg tenaciously with all the bending and twisting it takes to get them into the sauce. We ordered the fries with the malt vinegar powder. Oh, I am getting some of this stuff. The pungent bite of vinegar without the loss of crispness is glorious. 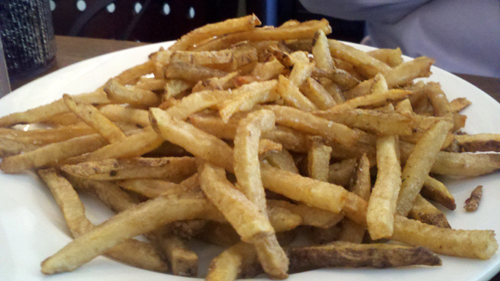 The fries are well done in and of themselves. Stuffed, way stuffed, but when our server stopped by to whisper something about dessert we soon had a couple headed our way. A definite mistake in the stomach capacity department but it turns out the desserts are well done. 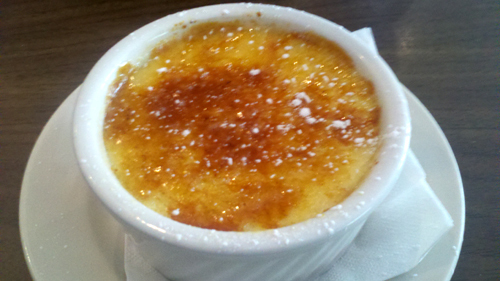 A Grand Marnier crème brule was very well done with a crisp bitter crust topping a sweet and lightly bitter orange custard. The ramekin is large and couldn’t be finished but what could be managed was appreciated. 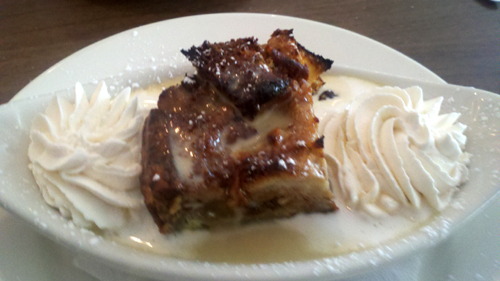 Even better, by my estimation, was the “New Orleans” bread pudding with a Maker’s Mark Bourbon sauce. Rich eggy bread, baked with spices and sugar which was very nicely balanced with the vanilla and caramel bite of the bourbon. Our experience was better than expected. We will have to try the front room sometime soon.